Wild Heart: The Possibility of Wilderness in Aotearoa New Zealand, edited by Mick Abbott and Richard Reeve (Otago University Press) 224 pp. 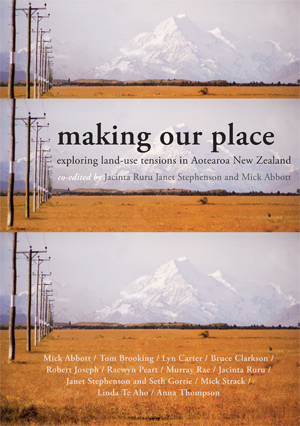 $45; Making Our Place: Exploring Land-use Tensions in Aotearoa New Zealand, edited by Jacinta Ruru, Janet Stephenson and Mick Abbott, (Otago University Press), 243 pp. $45. Although we are becoming an increasingly indoor nation, our wild and natural landscapes, our ‘clean, green’ image, and our agricultural heritage all remain strong in the identity of most New Zealanders. The topics discussed in these two books have wide appeal. Both books address current and contested questions about our use of and relationship with the land, and provide glimpses into history. My concern is that they may be read by only a narrow range of potential readers – mostly by academics and professionals over 40, I suspect, unless interviews, magazine articles, blog posts and so on can draw other readers in. Of the two volumes, the more attractive cover and compelling title of Wild Heart drew me in first. The ‘possibility’ of wilderness in the sub-title intrigued me. Don’t we have wilderness in New Zealand? The 20 viewpoints presented in this multi-authored book stretched and challenged my ideas of what ‘wilderness’ is. The contributors explore the different meanings of wilderness: as a place, a legal definition, an experience, and a perception. Wilderness is different things to different people. It can be majestic natural landscapes untouched by humans, or a scruffy bit of bush down by the creek where kids build huts. The editors liken the many different views to channels of a braided river, sometimes meandering apart and at other times converging. Many of the contributors are experienced trampers, like Shaun Barnett, who describes wilderness experiences of his own, including the isolation, remoteness, and sense of achievement. ‘In New Zealand,’ he writes, ‘the strict legal definition of a wilderness is about as wild as it gets’. Here he is referring to the eleven formally designated ‘wilderness areas’, which are accessible only to the few who are fit, experienced and completely self-reliant; here there are no huts or tracks. Barnett argues that such places are essential (for those who are able) to experience nature completely without human intervention, and even those who don’t or can’t access such places agreed with the statement ‘It’s good to know wilderness exists, even if I decide never to use it.’ Barnett agrees with the ‘recreation opportunity’ spectrum — a zoning system which places wilderness areas at one end of the spectrum, and wheelchair accessible tracks at the other, so there are opportunities for everyone to experience natural places. Jonathan West challenges the concept of what is natural or undisturbed; humans have irreversibly changed the New Zealand landscape, and of course nature has changed and evolved over millennia before we arrived here. Yet many of us have a dualistic idea of humans separate from nature, rather than part of it; and a polarising concept of land either being pristine and untouched, or already tainted and therefore open to development. There is some history included, particularly of the establishment of the Department of Conservation in 1987 and its various policies since; campaigns to preserve our wilderness; and nineteenth-century explorer and settler ideas of wilderness, and their impact on Māori. The concept of wilderness as expressed in New Zealand literature shifted over the decades, writes Julian Kuzma, from that of a hostile place of fear to a place of reverence and of tourism. Tom Brooking explores the differences between New Zealand and U.S. views of wilderness, and why our attitudes have shifted towards those of the U.S. Many of the contributors lament the increasing encroachment of human impact on our wild landscapes; the success of the ‘100% Pure’ branding has contributed to their erosion. Les Molloy asks should visitor access be restricted in certain areas? Philippa Wells documents an early attempt to harness the Bowen Falls in Fiordland to generate electricity, showing that while we have become more aware of our environmental footprint, we have also become more and more exploitative, pushing for roads and gondolas in wild areas, and that ‘economic thinking continues to dominate the conservation debate’. Alison Ballance wrote her essay on a ship in the Southern Ocean, exploring her idea of wilderness through recalling wildlife encounters on trips to the subantarctic and various islands, as well as mainland tramps. In addition to the other contributors’ ideas of wilderness as being remote, challenging, and bringing a sense of joy, discovery and wonder, she talks of wilderness having a living heart and soul — a resilient natural ecosystem. Jacinta Ruru offers the concept of wilderness as a walled garden, looking at how colonists deemed indigenous place wilderness, with specific reference to the gifting of Tongariro by the paramount chief of Ngāti Tuwharetoa in 1887 for use by Māori and European as a national park. Wild Heart is a lively mixture of ideas and deserves to be read and discussed, not just among conservationists, trampers, farmers and those in the tourism industry, but more widely. There is refreshingly little obfuscating academic-speak. What makes it engaging are the personal wilderness experiences of the writers: the sense of joy, awe and spirit; the passion for our wild places; being pushed to physical and mental limits. However, there are three things I would have liked this anthology to possess: more perspectives from Māori, a contribution from a hunter, and a larger typeface. Making Our Place is the more academic — but still accessible — of the two books, and includes more Māori perspectives. Another multi-authored book, it looks at some historic and contemporary tensions between different groups of people over land in New Zealand. Essays are grouped in three sections: challenges, transformations, and negotiations. The back cover blurb says that all the writers ‘engage with the underlying question: are there better ways to reconcile the tensions inherent in our struggles with the land and with each other?’ While to a greater or lesser degree they engage with this question, they do not necessarily supply specific or practical answers to what those better ways might be. Probably the most specific answers were those of Mick Abbott, in his essay ‘Being Landscape’, in which he talks about participating or being part of the landscape — where do we end and the landscape begin? One of his suggestions was that trampers could be asked to add river rocks to gabion baskets to create foundations for huts and bridges. Also relatively practical was Bruce Clarkson’s recommendation of a collaborative approach to the protection and restoration of indigenous ecocystems in Taranaki, involving locals, councils and DOC working together and focusing initially on some named important corridors. But a number of suggestions were vague, such as Anna Thompson’s suggestion for a way forward in the Mackenzie Country land-use conflict: ‘Now is the time to re-evaluate the situation in the Mackenzie, and develop a range of tools to ensure that economic development and landscape protection are allies, rather than enemies.’ All well and good, but what sorts of tools and how would they work? The examples given in all the chapters provide tangible illustrations of land-use conflict. Some are well known and have featured in national media in recent times. Jacinta Ruru’s chapter is a clear overview of and background to the foreshore and seabed debate, and provides detail and clarification of points that may have been glossed over or missed out by mainstream media. Other chapters are more pertinent to a particular group of interest or local area, such as Raewyn Peart’s case study of the Tutukākā coast, but readers will see similarities to the development occurring in other rural coastal communities. Wind farms crop up in this book too, and the authors of this chapter, Janet Stephenson and Seth Gorrie, recommend that wind farm advocates attempt a more nuanced understanding of people’s perceptions and values of the landscape. Linda Te Aho tells the story of her ancestral river, the Waikato, from the creation myth, through land confiscations, dams and degradation, to the Waikato River Settlement which provides a new blueprint for co-management, and she expresses hope for the health and well-being of the river. While possible solutions to land-use conflict may not be spelt out, attentive reading proves there are recurring common threads, centred on establishing a sense of communities of shared interest: collaborative and joint approaches, a genuine inclusion of Māori (and non-Māori) values and concerns, dialogue and a building of consensus amongst all affected parties from the early stages. PHILIPPA JAMIESON is editor of Organic NZmagazine and author of The Wild Green Yonder: Ten seasons volunteering on New Zealand’s organic farms.